王逸枭, 郑凌霄, 管国宇, 尹灿灿, 刘啸, 汪书然, 温子昂, 陈樱玮, 程序, 孙恩涛. 居室内检获的羽美绥螨形态和DNA条形码鉴定[J]. 中国媒介生物学及控制杂志, 2018, 29(6): 582-585. WANG Yi-xiao, ZHENG Ling-xiao, GUAN Guo-yu, YIN Can-can, LIU Xiao, WANG Shu-ran, WEN Zi-ang, CHEN Ying-wei, CHENG Xu, SUN En-tao. Morphological and DNA barcoding identification of the indoor Ameroseius plumosus[J]. Chin J Vector Biol & Control, 2018, 29(6): 582-585. Corresponding author: SUN En-tao, Email: asdentao@126.com. Abstract: Objective To identify the mites accurately and rapidly. Methods Most of the mites seized on a plush toy in a Children's room in Wuhu in July 2016 were identified by morphology. Six individuals were amplified by the cytochrome C oxidase subunit Ⅰ (COⅠ) gene. Meanwhile, based on the gene, phylogenetic tree of the known Ameroseiidae mites was constructed by Neighbor-Joining method. Results According to morphological observations, the mite we seized was identified as female Ameroseius plumosus, belonging to Ameroseiidae, Ascoidea, Gamasina. The DNA barcode of the COⅠ gene was obtained from the mite for the first time. The six individuals were identified as the same species because all the inter-individual's DNA barcode differences were less than 0.5%. 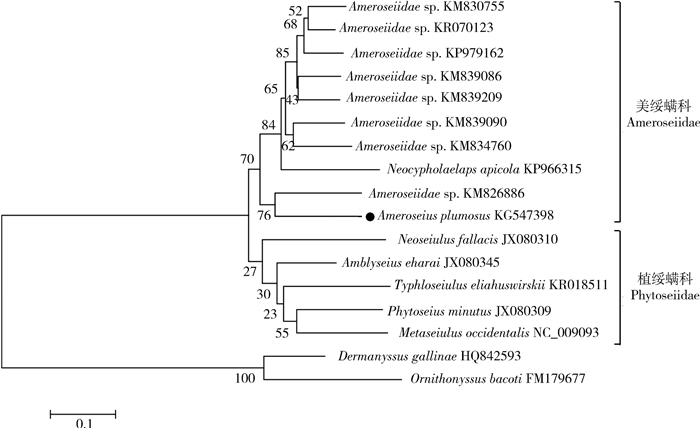 Phylogenetic tree shows that A. plumosus is associated with other individuals of Ameroseiidae. Conclusion It's the first time that the A. plumosus was found on a plush toy. Combining morphology and DNA barcode techniques together could provide a good tool for the identification of the medical vectors rapidly and accurately. 黄丽琴, 郭宪国. 肾综合征出血热媒介革螨及其宿主动物研究进展[J]. 中国媒介生物学及控制杂志, 2010, 21(3): 271-273. 中国科学院中国动物志委员会. 中国经济昆虫志.第40册.蜱螨亚纲:皮刺螨总科[M]. 北京: 科学出版社, 1993: 42-43. 顾以铭, 王菊生, 侯平. 云南省的革螨[J]. 贵阳医学院学报, 1986, 11(3): 199-205. 徐浩锋, 许小频, 王雅静. 广东省毛绒玩具卫生质量调查[J]. 中国卫生监督杂志, 2000, 7(6): 247-248.